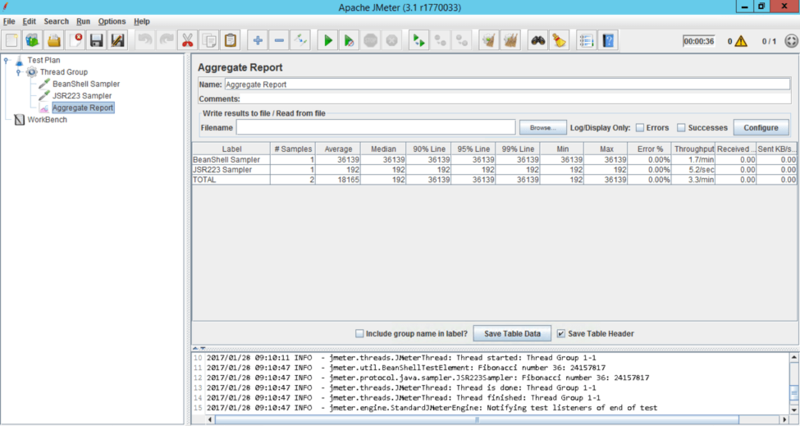 JMeter is a very powerful tool. Out of the box, there are enough Test Elements to implement almost any test scenario, even a sophisticated one. 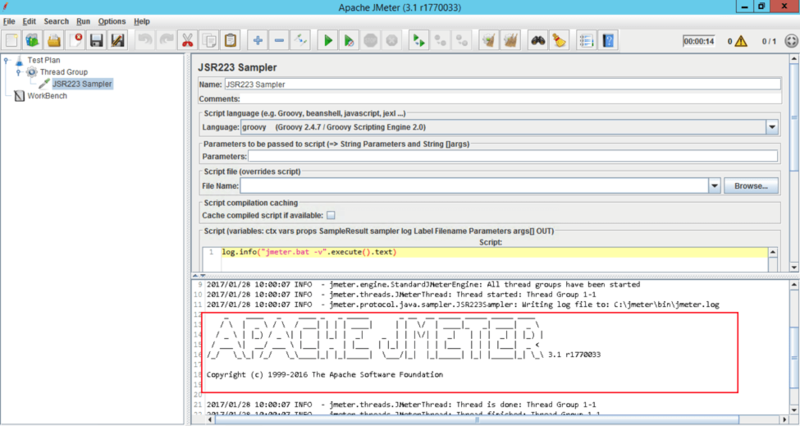 However, certain use cases cannot be covered by using default JMeter test elements and functions alone. Therefore, scripting with JMeter and Java API methods may be required to bypass the limitations. This leads to the following question: which scripting language to use? Starting from JMeter version 3.1, Groovy became the default scripting language for JSR223 Elements. This change has a history. 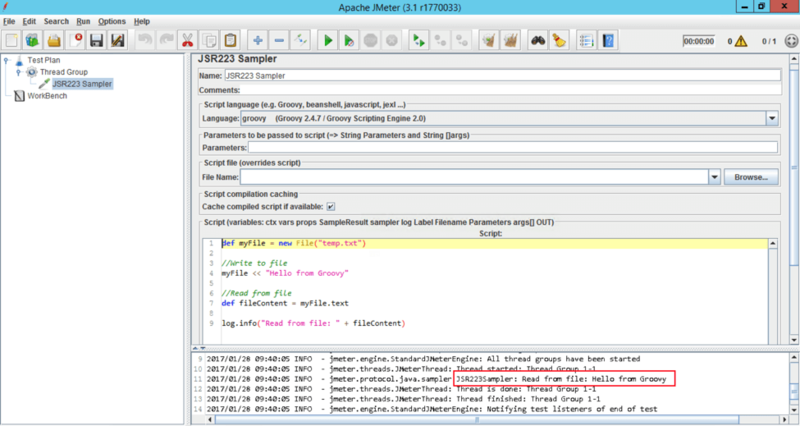 While JSR223 elements have always had Groovy support (as well as any other scripting engine, given the relevant library is in the JMeter’s Classpath), groovy-all.jar became a part of the default JMeter bundle only in the JMeter version 3.0). Prior to that JMeter users had to download the Groovy library manually and include it in the JMeter classpath. This caused some problems in using 3rd-party plugins, scaling out JMeter tests when new JMeter instances had to be created on-the-fly and added an extra step when performing an upgrade to a newer JMeter version. Now, all of these problems are gone and Groovy is the only recommended scripting language. 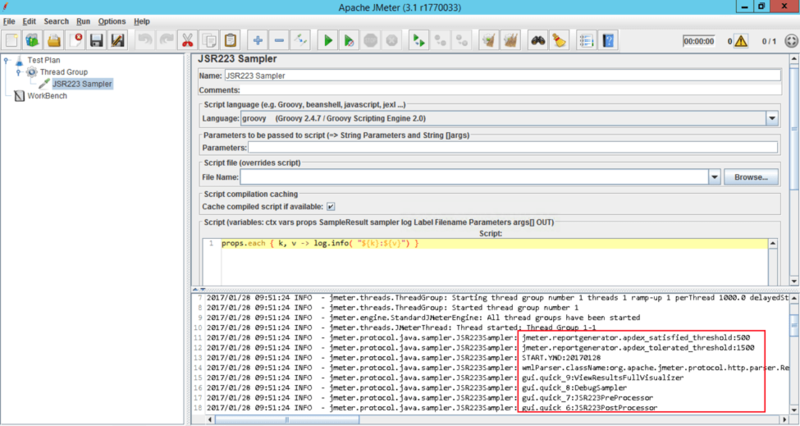 Let’s compare the performance of Groovy scripts with Beanshell equivalents by starting with something very basic, for example printing JMeter test start time (the relevant JMeter variable is TESTSTART.MS to jmeter.log file. At first glance, Beanshell is faster (1 ms response time for Beanshell Sampler versus 5 ms response time for JSR223 Sampler). This is due to Groovy scripting engine size. As groovy-all-2.4.7.jar library size is almost 7 megabytes, it takes more time to load it. So if you use scripting for something very “light” and something which is being called once - it is still fine to use Beanshell. Now let’s try something “heavier”, for instance calculating 36th number of Fibonacci sequence and again printing it to jmeter.log file using Beanshell and Groovy. The above code is used in both the Beanshell and JSR223 Samplers. As far as you can see, the JSR223 Sampler calculates and prints the number out in 192 milliseconds, while the Beanshell Sampler needs over 36 seconds to do the same. So if you use scripting for generating the main load or the scripting sampler is called multiple times with multiple threads, the choice is obvious - go for Groovy. Groovy provides native syntax for some use cases that you might find useful for simplifying everyday life tasks. myFile << "Hello from Groovy"
The brand new __groovy() function is available since JMeter 3.1 and it allows evaluating arbitrary Groovy code anywhere in the script where functions can be placed. Assuming all the above and given that Groovy is now a part of JMeter distribution, I would recommend everyone start using it for scripting and eventually migrate the scripting logic developed in other scripting languages, to Groovy. As usual you are welcome to use the below discussion form for any queries or feedback. Want to learn more? You might be interested in viewing the webinar, Advanced JMeter Scripting - Writing Assertions in Groovy. Try out BlazeMeter by putting your URL or JMX file in the box below, and your test will start in minutes.